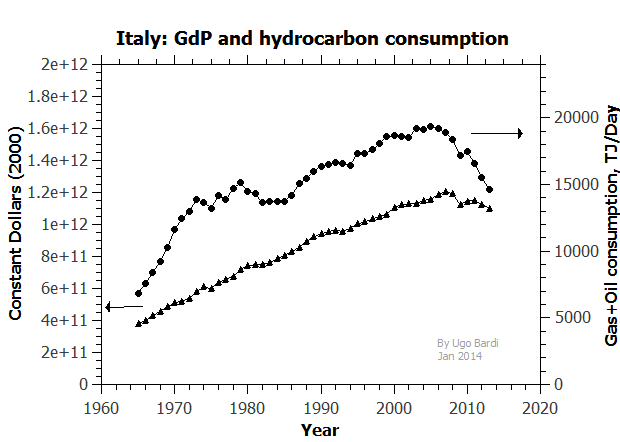 As an integration of a previous post, where I was discussing the trends in oil and gas consumption in Italy, here is a comparison with the historical trends of the gross domestic product (GdP). As you can see, the GdP has started a clear trend of decline, after having peaked in 2007. No GdP would exist without a continuous inflow of natural resources into the economy and the most important of these resources is energy. In Italy, gas and oil are by far the largest sources of primary energy (ca 77% of the total). So, qualitatively, we would expect that a decline in energy production would accompanied by a decline in GdP. Now, the question is what causes what? That is, is the decline in GdP causing a decline in the demand and, consequently, a reduction in energy consumption? Or is the decline in energy availability that causes a decline in GdP? The data seem to favor the second hypothesis, since it is clear that "peak GdP" (2007) trails "peak hydrocarbons" (2005). However, the concept of "cause and effect" may be misplaced in this case. Starting from the results of a paper published in "Energies" (U. Bardi and A. Lavacchi "A Simple Interpretation of the Hubbert Model" 2009), we can argue that the GdP can be seen as a proxy for the dissipation of the "capital stock" of a system where capital and resources are related in a feedback relationship. That is, capital is created in proportion to the rate of resource exploitation and resources are exploited at a rate proportional to the available capital. 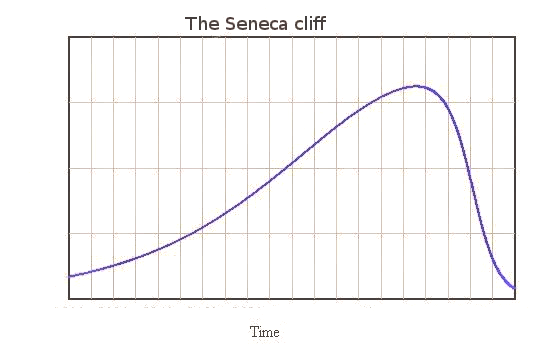 In the case of a non renewable resource, such as oil and gas, gradual irreversible depletion generates "Hubbert-like" (bell shaped) production curves and a peak in the rate of resource exploitation coming before the peak of capital dissipation. 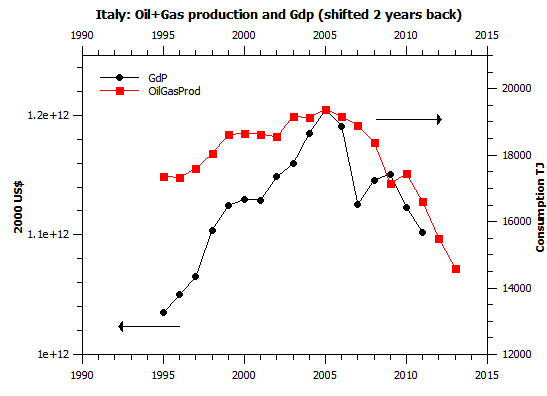 In short, the economy of Italy seem to be declining as a consequence of the increasing cost (or - equivalently - declining energy returns, EROEI) of primary energy sources, mainly natural gas and crude oil. If such is the case, decline is irreversible. The only possibility to avoid this outcome is to decouple the economy from non renewable resources, generating energy using renewable ones. Note for those who hate the concept of Gross Domestic Product, GdP. It has been said many times that GdP growth is not a worthwhile objective, since growth has little or nothing to do with quality of life and personal happiness. Fine, I agree, but we should not be confusing the concept of "growth", which we normally measure in terms of GdP and GdP itself, which does not necessarily imply growth. GdP is simply a useful measurement of the performance of an economy. Unfortunately, however, it is a fact that when GdP goes down, people tend to be very unhappy. And EU is preparing some laws to reduce energy consumption by 9% in 6 years (1.5%). I fear the result. In iSpain we can see the reduction of traffic and transport (as well as car sales: I work for a car manufacturing company) similar to what you posted last time. In our case, the correlation between GDP and oil consumption is 98.2%, and for each point that GDP increase, oil consumption is about 0.5% half that value. If this also Works when decrasing energy, would that translate as a GDP fall of 18%? I fear the replies to that. Ugo, in relation to your above article how would you comment recent news reports stating that in Spain wind power has just topped all other electrical energy productions sources? It seems that renewables might play a more important role in hydrocarbon post peak years after all? "Red Eléctrica de Espan~a (REE) released a preliminary report on the country's power system late last month, revealing that for "the first time ever, [wind power] contributed most to the annual electricity demand coverage". According to the figures, wind turbines met 21.1% of electricity demand on the Spanish peninsular, narrowly beating the region's fleet of nuclear reactors, which provided 21% of power." WTF? If we consume, we pollute, if we don't, we don't grow the economy. Renewable energy generators in their lifetime do not return the energy used to make them. They are energy loss makers. Don't you think you should update your database a little? Isn't gasoline in Europe highly taxed, thus making the consumer pay a higher effective price for it? Those taxes serve as a price buffer that can be exploited by lessening the amount of tax to allow the consumer to pay a cheaper rate that can allow more economic breathing room. I hate to mistaken for one of those obsessive anti-tax types, but it might be good policy to lessen or eliminate taxes on the commodity to enable a healthier economy, rather than myopically trying to squeeze a lemon based upon a lemon squeezing model that was more valid in times of cheaper gas. Reducing taxes on gasoline would send the government out of business (which might be a good thing, after all). But it won't happen. They are already in deep trouble because the lower demand for gas has reduced their income and they are scrambling to tax something else. As long as they control the police and the army they won't (they can't) reduce taxes. I think it would be very interesting if you could do this analysis for a representative sample of EU countries and add to the graphs some key political-economic events such as austerity measures, bailouts, etc. It might allow us to see some patterns. Of course it would be interesting, the problem is that it becomes a full scale research project. It needs someone who would finance it: any ideas, anyone? Ugo, I would like to play the role of the devil's advocate, about the graph with the oil&gas consumption and the GDP shifted backward. Let's imagine I'm a cornucopian, so that for me GDP is what it is, and O&G is just a commodity which consumption is a function of GDP. Something like O&G = GDP * (1 - (Y-Yref)/100), if I think that consumption is proportional to GDP, and that there is a 1% per year improvement of energy efficiency. Now, I see that GDP, which is, as I said, what it is, made some kind of smooth symetrical peak (the scale you use for GDP has its zero far far down, so variations are not that big, at least from the point of view of the statistician, not of the guy who lost his job !). Let's model this smooth peak as something like GDP = GDPpeak * (1 - (Y-Ypeak)²/1000) (the /1000 factor seems to be the order of magnitude of the curvature we see, it is equivalent to a annual growth rate of 2% ten years before the peak, and -2% 10 years after). If you combine the two equations, you get that O&G reachs its peak 5 years before the peak of GDP. So : this is a kind of "ad absurdum" demonstration that having the oil and gas consumption peaking a few years before the GDP is not a proof that GDP is a consequence of oil and gas consumption. Anyway, even if I don't like the shifted graph, I'm just convinced that the conclusion is right. I think that the best way to show it is to plot the two time series in the GDP-O&G plane, and to make the observation that the line tends to always swirl leftwards (if O&G is X and GDP is Y) each times that something unwanted happens. About Italy : I understand from your data that Italy as a whole is not yet riding the cliff down, in the sense that there doesn't seem to be some kind of generalized disruption. But I get the feeling that anything can happen at any moment... By the way, what is the annual (de)growth rate, according to the official statistics ? Well, of course a single graph is no proof of anything. However, I tend to see a pattern in many such graphs: the system accumulates resources from the exploitation of natural resources. Then, there is some "slack", in the sense that these resources - call them "capital" are still there while the flow of resources dries up. So, it can keep spending them. In other words, imagine you lose your job and hence salary. Then, for a while, you can keep your lifestyle by drawing on your saving account. Of course, not forever - so at some point you'll have a "peak spending" that comes after your "peak salary." Which I think is what's happening in Italy. About your other question, the GdP decline in Italy has been of the order of 1%-2% per year, which, so far, amounts to a marginal change. But the situation is getting tougher every day. The government is fighting for its own survival by taxing people to death. As long as there is something to tax, things won't change. That won't be forever: even people's savings are not an infinite resource. Chi commenta fa errori clamorosi.In italia l'energia è cara perchè troppo fossile e gas in particolare. Poi le rinnovabili variabili non si bilanciano con acqua e mare che farebbe scendere il costo a 20 euro il MWh contro i 100 euro del gas,5 volte tanto,e gli 85 euro della lignite.Se mettiamo syngas fatto dall'acqua,le turbine termoelettriche girano a 45 euro a MWh e dallo syngas passiamo al biofuels,siamo attorno a 0,50 centesimi litro.Chi non vuole il piano acqua energia che è da zanonato ma chiuso in cassaforte? L'Eni in primis,poi Enel ben suffragati da Assoelettrica che è l'ignoranza di perpetuare vistosi errori energetici.Attendo risposte dal Governo e non mi frega niente del piano trivellazioni di Scaroni,fatto per confondere gli allocchi. PCaffese, do you have tested the conspiracy theory random generator for your post? It seems so. Your claims are so disingenuous that I hope so. PCaffese , hai per caso usato il generatore casuale di teorie del complotto per il tuo post? 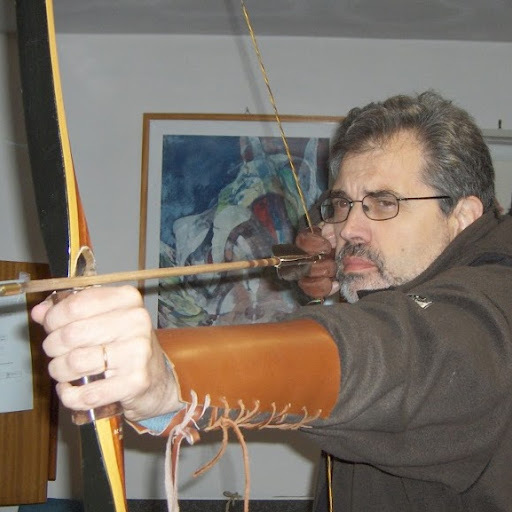 sembrerebbe cosi. Le tue affermazioni sono cosi' sconclusionate che spero sia cosi.